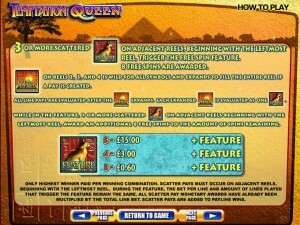 Temptation Queen is a slot machine themed around Ancient Egypt, like so many others are, and it was created by WMS. The angle they went with here has to do with the queen of the Egyptians, Cleopatra, but they did it a bit differently, focusing on how tempting she was for the Roman rulers. It’s not an angle that they focus on too much though, with the exception of the top jackpot symbol which shows Cleopatra in a supposedly tempting stance. I think it’s safe to consider it a very regular Egyptian themed slot machine, despite the unique angle. 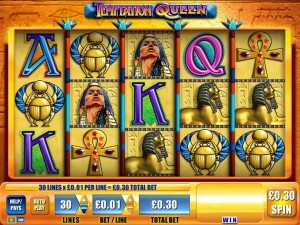 You have 30 paylines in Temptation Queen. 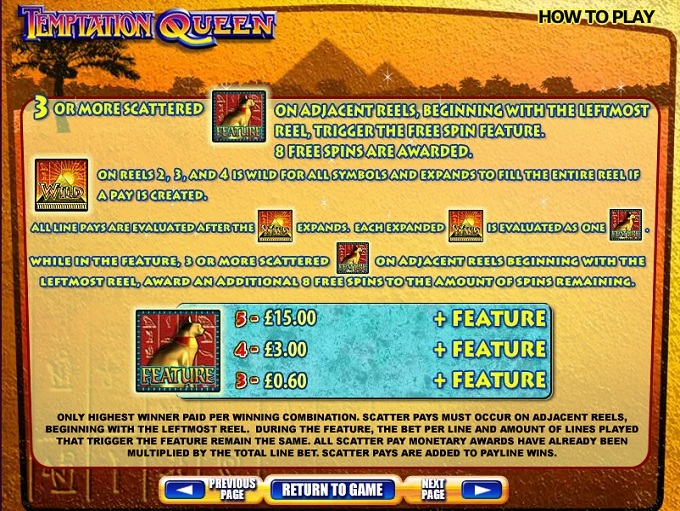 The features give you expanding wilds, a scatter symbol and free spins. As for the big prize, you can get $7,500 from it. If you consider the features which Temptation Queen has in store for you, you will find that they’re looking pretty good. You have an expanding wild for starters, followed by the scatter symbol and the free spins which it brings. The wild’s image is that of the Pyramid, and it even has the WILD logo in front to make it easy to spot. The symbol has both pros and cons to it. The pro would be the fact that it is an expanding wild, so you can expect it to take over the reel entirely when this brings you a paying combination. The cons would be the fact that it is only available on the three middle reels and the lack of a prize of its own to give away, which is understandable since it doesn’t appear on all the reels. The slot’s Cat symbol was chosen to act as the scatter of Temptation Queen. To get its prizes, the scatters need to appear on adjacent reels, starting from the leftmost reel. It’s a limitation that I hate seeing in slots, and fortunately most of them don’t have this requirement. Unfortunately, Temptation Queen does. Your rewards will consist in free spins and in payouts of 2x to 50x the value of the bet. Get 3+ scattered Cats on the right reels, and besides the prize I mentioned above you will also receive access to 8 free spins. A wild that expands counts as a scatter symbol. To retrigger the 8 free spins, you need the 3+ Cats present again. You’re covering 30 paylines with your bets, so obviously you need 30 coins to spin the reels. A coin has a minimum value of only $0.01 and a maximum of $5. You can spend as much as $150 per spin. With help from the Queen herself, you can get paid 1,500 coins for a combo, which will mean $7,500 cash. The scatter symbol offers the same amount. 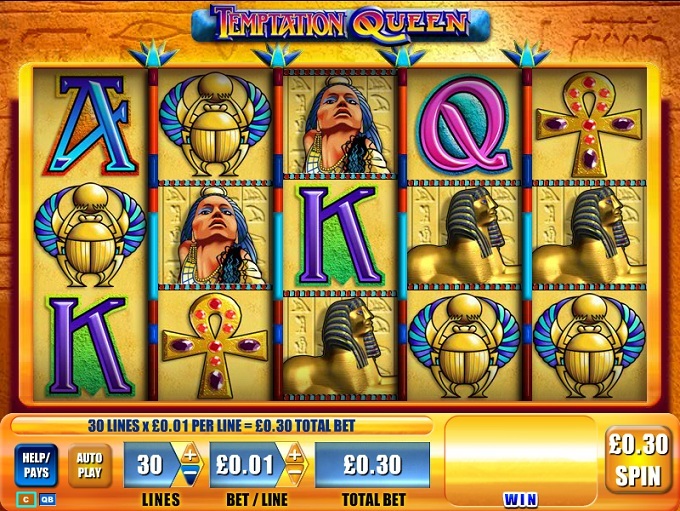 If you’ve played Egyptian themed slot machines before, and you probably did since they’re everywhere, you’re not going to be impressed with anything that Temptation Queen has to offer. The temptation angle is not followed through, with the exception of that one symbol with the queen sitting in an unnatural stance, so it doesn’t have anything different graphics wise. There is a lot of yellow in the game, from the walls of the pyramids, to the objects which are used as symbols. 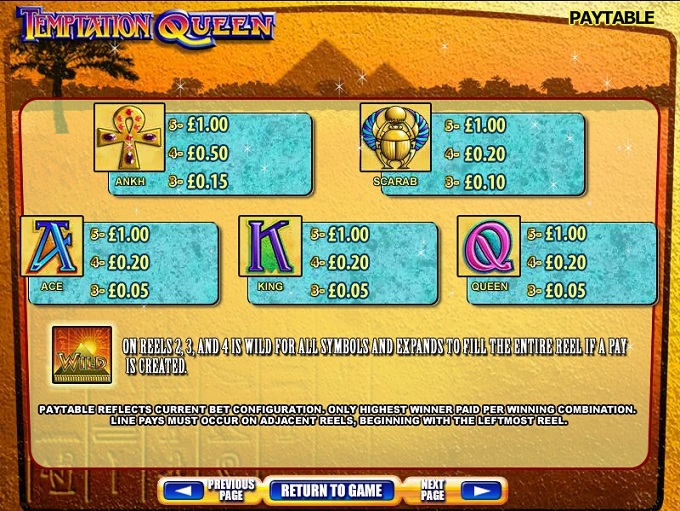 Symbols: Pyramid (wild), Cat (scatter, 50x total wager), Temptation Queen (1,500 coins), Sphinx (500 coins), Falcon (500 coins), Ankh (100 coins), Scarab (100 coins), Ace (100 coins), King (100 coins) and Queen (100 coins). 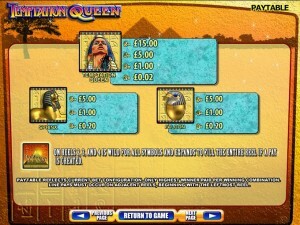 Egyptian themed slots are much too common, so the topic isn’t a reason to play it, but that expanding wild or the free spins could do it for you. Still, all things considered, it’s not an impressive offer that WMS makes here. 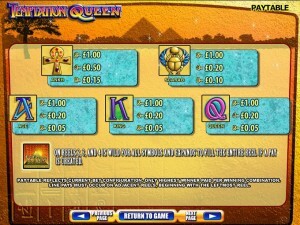 Temptation Queen can be found at any WMS casino, where you get a chance to play it for real money or in free mode.